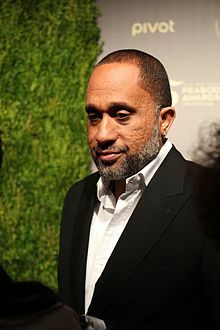 Kenya Barris (born August 9, 1974) is an American writer and producer. He has created numerous television shows, including the critically acclaimed ABC Original Television Series Black-ish, and briefly also co-executive produced The Game. Barris also co-created and produced America's Next Top Model with Tyra Banks. He also penned the blockbuster Girls Trip. He reteamed with Tracy Oliver on the 2019 film Little. Barris was born in Inglewood, California  and is an alumnus of Clark Atlanta University. He is married to Rainbow Barris, a doctor, and they have six children. Black-ish was the 2018 NAACP Image Awards big winner. It was named best comedy series and Tracee Ellis Ross and Anthony Anderson took acting honors. Black-ish was the winner of the Entertainment and Children’s Peabody Award in 2016. Kenya Barris and Black-ish also won the 2017 NAACP Image Award for Outstanding Writing in a Comedy Series. He was nominated for the same award in 2018. Barris was also nominated for a Primetime Emmy Award for Outstanding Comedy Series in 2016, a Gold Derby Outstanding Producer of Episodic Television Comedy in 2016, and a PGA Award for Outstanding Producer of Episodic Television, Comedy Black-ish in 2014. In 2016, Barris won the Rod Serling Award for Advancing Social Justice Through Popular Media. In 2018, he donated $1 million to Clark Atlanta University, which gave him an honorary doctorate in humane letters. ^ a b Nussbaum, Emily (April 25, 2016). "In Living Color" – via The New Yorker. ^ a b "Kenya Barris On 'Black-ish' And What Kids Lose When They Grow Up With More". ^ Andreeva, Nellie (August 21, 2015). "'black-ish' Creator Kenya Barris Inks Overall Deal With ABC Studios". ^ Harriot, Michael (January 9, 2019). "#BlackGirlMagic: Black-ish Star Marsai Martin Set to Become Youngest Executive Producer in Hollywood History". The Grapevine. Retrieved January 9, 2019. ^ "Film Bio: Kenya Barris - The Talk - Race in America - PBS". 10 January 2017. ^ "You Made It Weird with Pete Holmes : Kenya Barris Returns". ^ "75th Annual Entertainment & Children's Programming Winners". Peabody Awards. Peabody Awards. Retrieved 27 March 2017. ^ "48th NAACP Image Awards". 48th NAACP Image Awards. NAACP Image Awards. Archived from the original on 19 March 2017. Retrieved 27 March 2017. ^ "Kenya Barris Awards". IMDB. IMDb.com, Inc. Retrieved 27 March 2017. ^ Lewis, Dave. "Creator of 'black-ish' Kenya Barris to receive the 2016 Rod Serling Award". ENTERTAINMENT/TELEVISION. L.A. Times. ^ "Blackish creator to give million-ish to Clark Atlanta University in Grown-ish gift". AJC. AJC.